Press conference will happen right where I am currently - 550 Aresenal St. No time announced. Media at the scene should locate to 550 Arsenal Street. 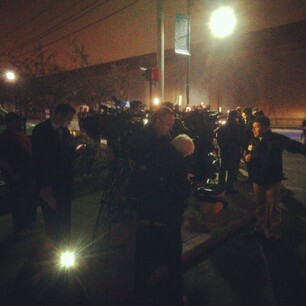 RT @MassStatePolice: Change in plans--Media should report to Target Store at Watertown Mall for upcoming briefing. From MA State Police: "Residents in/around Watertown should stay in their residences. Do NOT answer door unless it's ID'd police officer." RT @Boston_Police: #CommunityAlert: Residents of Watertown asked to stay indoors. Do not answer door unless instructed by a police officer. RT @WesleyLowery: Rain now falling as media flood mall parking lot for announced news conference. We're still looking for photos from #watertown. You guys have been a huge help tonight. Keep it coming. WATERTOWN — One suspect in Monday’s Boston Marathon bombings has been apprehended, according to an official with knowledge of the investigation. Another appears to remain on the loose in Watertown after a firefight with police. A 20-block perimeter was established as authorities searched for him. A scene of chaos descended on Cambridge and Watertown late Thursday night and early Friday morning, as police confirmed an MIT police officer was shot and killed, and an apparent carjacking led police on a frenetic chase into Watertown. Hundreds of police officer flooded Cambridge and Watertown. A spokesman for the MBTA said that a transit officer had been shot and was in serious condition. Massachusetts State Police spokesman David Procopio said early Friday that the violent events at MIT and Watertown appeared to be connected, and that federal authorities were investigating whether the violence of Thursday night and Friday was connected to the marathon bombings. 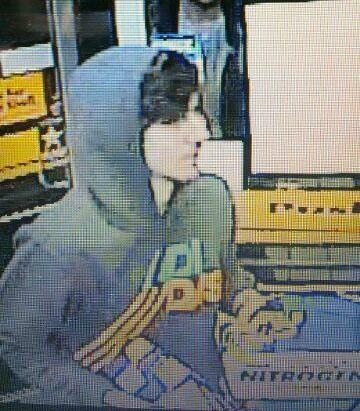 At least one of the suspects in Watertown appeared to be a man in his 20s. FBI agents were on the scene. John Antonucci’s 79-year-old mother called him hysterical from her home in Laurel Street. She heard about five gunshots and didn’t know what to do. Residents describe the neighborhood as safe and family oriented, where they leave doors and windows open, and feed stray cats. Standing at Quimby Street and Nichols Avenue as police officers hastily strung up caution tape, Lindsay Gaylord, 25, and Collin Ausfeld, 26, peered over the scene to get a glimpse of their apartment about a block away on Dartmouth Street. The couple said they moved to the neighborhood in January, leaving behind their Belmont place, because Watertown was closer to the city, and their block was quiet, safe, and friendly. Adam Healy, 31, said he stepped outside for a cigarette near one of the shooting scenes in Watertown, when he heard gunfire. Imran Saif, a cab driver, was parking his car for the night near Dexter and School streets and was preparing to bike home to Cambridge when he heard a series of loud noises that he said “sounded like fireworks.” He said he biked toward the sounds, thinking they were fireworks, when people in nearby houses began waving him back, telling him it was gunfire. Dan MacDonald, who lives on Bigelow Avenue and Mount Auburn Street, near Watertown Square, said he was watching TV and talking with his girlfriend when they began hearing sirens -- just a few at first, then more -- “maybe five or seven, racing at this point.” Then in the distance they heard gunshots, about 15, he said, within 10 seconds. The bedlam in Watertown was preceded by a spasm of violence in Kendall Sqaure, in Cambridge. An MIT officer, who has not been identified, was shot multiple times at 10:48 p.m. Main and Vassar streets, near Building 32, better known as the renowned the Stata Center. 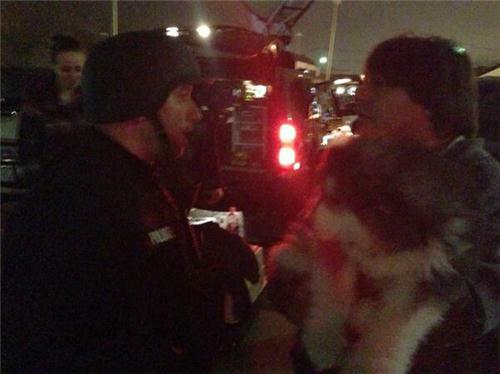 No one else was hurt, and no ­arrests had been made by early Friday. That shooting sparked a massive manhunt, which fanned out from ­Kendall Square over an area that had endured a tragic and tumultuous week, in the aftermath of the fatal explosions at the marathon. The university issued an alert to students and faculty to remain inside, which was later lifted. The grievously wounded officer was taken to Massachusetts General Hospital, where he was pronounced dead. At the hospital, family members of the officer shot and killed declined to comment or give the officer’s name. About a dozen gathered outside the hospital’s emergency room, hugging and consoling one another through the night. Marcella Bombardieri, ­Brian MacQuarrie, Martine Powers, Maria Sacchetti, and Milton J. Valencia of the Globe staff and correspondents Jeremy C. Fox, Haven Orecchio-Egresitz, Jaclyn Reiss, and Gal Tziperman Lotan contributed to this report.